EIGHT-year-old Ruaraidh Stephen – from Fort William in Lochaber – has won a Scotland-wide competition to design a ‘Highland Haggis Festival’-themed gondola for Nevis Range Mountain Experience, home to the UK’s only mountain gondola. The competition is part of the 2017 Highland Haggis Festival, the family and fun-focused celebration of Scotland’s iconic national dish, that will be staged in the village of Spean Bridge, near Fort William, in the ‘Outdoor Capital of the UK’, on Saturday 01 and Sunday 02 April 2017. Ruaraidh Stephen, who is in P4 at Bun-sgoil Ghàidhlig Loch Abar, a Gaelic-medium primary school in the village of Caol near Fort William, was extremely excited to hear that his design had won the competition and reflected on the process. The judging panel, made up of Highland Haggis Festival committee members and Nevis Range staff, felt Ruaridh’s design best celebrated the haggis and The Highland Haggis Festival 2017. The fun design has now been specially adapted by local local firm, All Round Signs, and the new artwork has been wrapped around a Nevis Range gondola, bringing it to life in time for the start of the festival. 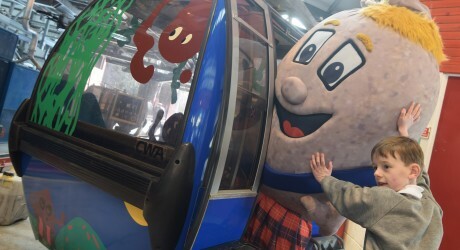 The Haggis Gondola will now be used every day to transport visitors from all over the world up the slopes of Aonach Mor. Heather Negus, marketing manager at Nevis Range Mountain Experience, said: “We had almost 100 entries from children from schools and nurseries across the Fort William and Lochaber area and further afield. “We even had entries from children as young as six months which we thought was brilliant! “We had a fun time looking through all the designs, both pictures and models, and are delighted they will all be on display at the Haggis Festival this weekend for everyone to see. “It was an extremely tough job choosing a winner as the standard was so high, so a huge thank you to everyone who got involved. As part of his fantastic prize, Ruaraidh Stephen and his family will be guests of honour at The 2017 Highland Haggis Festival and Ruaridh will officially open the event on Sunday 2nd April. The whole of Ruaridh’s class (a composite class of P3 and P4) have also been invited to a giant tea party at Nevis Range to celebrate Ruaridh’s winning design and all of the fantastic entries received from the pupils attending Bun-sgoil Ghàidhlig Loch Abar. All entries for the ‘Design a Highland Haggis Gondola’ competition will be displayed at Spean Bridge Primary School, the venue for the main events of Highland Haggis Festival, on Saturday 2 April 2017. The Highland Haggis Festival brings locals and visitors together to learn about the traditional and versatile Scottish dish. For more information about The 2017 Highland Haggis Festival,go to: https://www.highlandhaggisfest.co.uk; or https://www.facebook.com/HighlandHaggisFest. Hi-res images of Ruaridh Stephen [and Hamish The hJggis] and his winning gondola design at Nevis Range can be downloaded here: https://www.dropbox.com/sh/9bw7rjsj30p5mov/AADutcA9Faq_hPujzisi4maKa?dl=0. Please credit Iain Ferguson, The Write Image. The Highland Haggis Festival is a fun event to celebrate the traditional Scottish dish. It takes place in the village of Spean Bridge 0n Saturday 01 and Sunday 02 April 2017. Festival kicks off with a Haggis Supper and Ceilidh at Spean Bridge Community Centre on Saturday 1 April. Music from the marvellous Andrew MacDonald and Friends. Visit http://www.highlandhaggisfest.co.uk for more information and to purchase tickets. Haggis Hunt around Spean Bridge on Saturday and Sunday. Fun for the wee ones. Hunt the haggii hidden around the village and win prizes. Hector our Highland Haggis should be putting in an appearance to help with the Hunt. Forms available free of charge from SPAR Spean Bridge. Spean Bridge School on Sunday 2 April from 1pm to 5pm. Cookery demonstrations in our cookery theatre with local chefs, including Chris Nurse, sous chef at Inverlochy Castle. A Blind Taste Test, where butchers from around Scotland compete for the title of tastiest haggis, as chosen by the public. Haggis Festival Cafe, selling all things haggis, sweet treats, teas and coffees. An artisan food and craft fair, showcasing the best of local produce. The opportunity to taste local gin and beer, including Haggis Hunter ale. The popular Haggis Fling returns, where the public compete to fling haggis as far as they can. Results from the festival’s Song Competition and Gondola Wrap competition will be displayed around the venue. And, of course, there will be plenty of Haggis to try and to buy. A spokesperson from organisers of The Highland Haggis Festival, the Glen Spean and Great Glen Tourism Group, said: “The Highland Haggis Festival is the first of its kind to celebrate Scotland’s national dish, whilst at the same time showcasing its versatility. “While Burns Night is an important date in Scotland’s calendar, we are keen to highlight the fact that haggis is a wonderfully flexible dish and can be eaten on any day of the year and in so many different ways. Nevis Range is a visitor attraction located north of Fort William and south of Spean Bridge. The Mountain Gondolas transport visitors, skiers and snowboarders and mountain bikers to 650m on the slopes of Aonach Mor. Check out too twitter.com/allFoodPR, twitter.com/allFestivalsPR and twitter.com/allOutdoorsPR.